This doesn’t mean you should ditch the heavy, low-rep HIT style training immediately. Low rep ranges (5-8) are still the best way to increase strength, which you can then build off of for hypertrophy. The message here is to stop thinking in terms of high reps/lighter weight being strictly for “toning” and low reps/heavy weights are for building size. 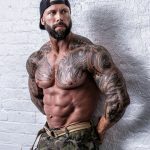 The real key factor to consider when it comes to weight training and building muscle is intensity – taking sets to failure and whether or not you’re subjecting your muscles to something they couldn’t lift before – setting a new PB. I’m hoping studies like this will help to clarify the popular myth as well as to help people to understand why I incorporate higher rep training as one phase in my training cycles.I like to train people based on science, not bro-science. If you still have doubts, I invite you to come out to train with me during one of my 25-rep, glycogen training days and tell me how you feel the next day.